Because one's Twitter activity doesn’t tell their whole story, the social network is giving brand partners better off-site insights with which to target users. A new “partner audiences” program expands on existing efforts by Twitter to broadly track user activity, and deliver more value for brands. “With partner audiences, you can now target Twitter Ads to users who have shown powerful signals of intent off of Twitter,” Kyle Boston, product manager of revenue at Twitter, explains in a new blog post. Now, partner audiences can be combined with what Boston calls “look-alike targeting,” which should help brands to expand their reach. Conversely, brand partners can also exclude partner audiences from their campaigns, if you only want to target customers who haven’t purchased a category or brand in the past. 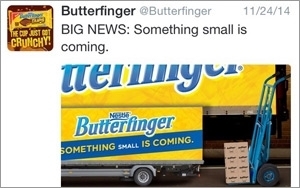 Among other brand partners, Twitter singled out Nestle’s Butterfinger brand, which it says used the new partner audiences program to achieve a 52% lift in engagement rate compared to Nestle’s overall performance in 2014. To follow consumer activity beyond its borders, Twitter is relying on expanded partnerships with data trackers like Acxiom and Datalogix. Attracting more ad dollars with better targeting is critical for Twitter, particularly as the company’s user growth continues to slow. “If your user base is getting passed left and right, you need to look for creative new sources of ad inventory,” Forrester Research analyst Nate Elliott recently told Social Media & Marketing Daily. To that end, Twitter recently announced plans to expand Promoted Tweets to third-party sites -- a move that marketing executives said was quite significant. This year, Twitter’s user growth will fall into the single digits, according to a forecast from eMarketer released earlier this week. Last year, Twitter's U.S. user base grew 12.1% to reach about 48.4 million users.